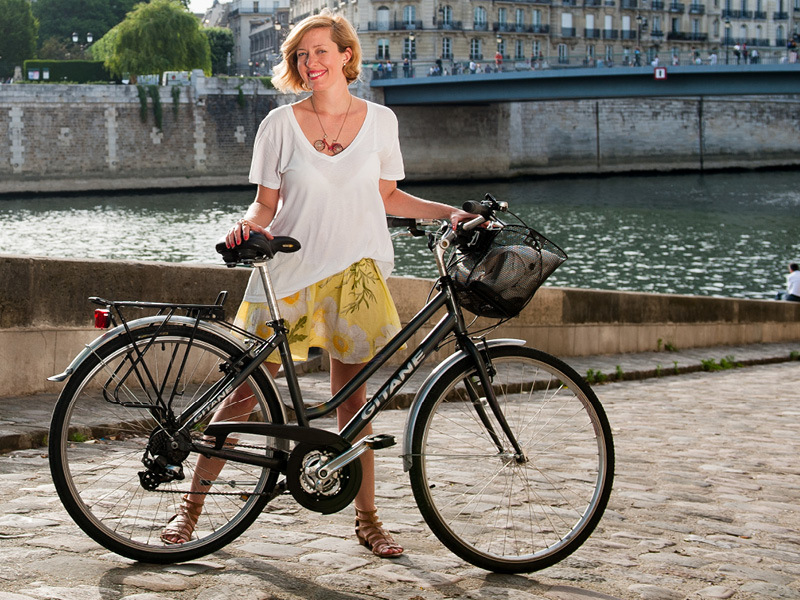 Paris on two wheels is the most unique, fun, and sustainable way to explore the city. Cycling with us will help you optimize your time, visit wonderful spots, understand how the city works and get amazing insider tips from locals! 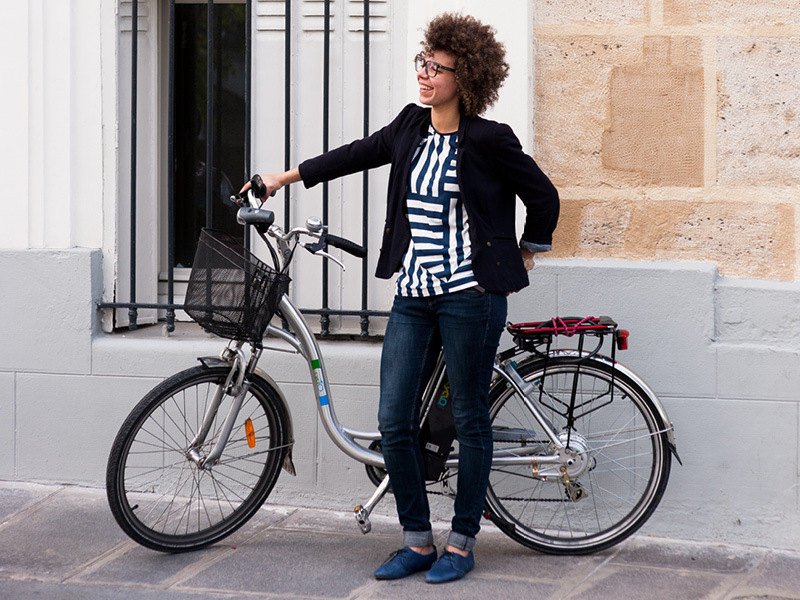 Go bike with us and connect quickly and easily with the real Paris. 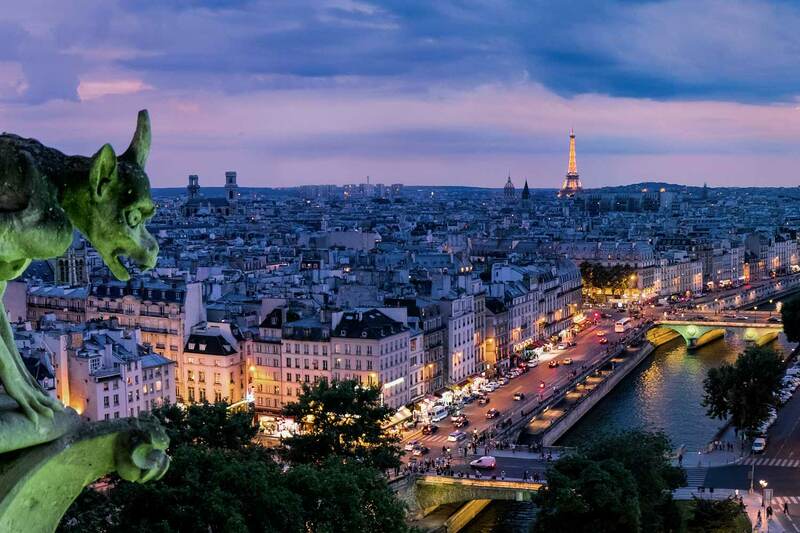 Paris is the most visited city in the world but – what only few people know – it has an area of only 105 km². So, no matter where you are, you are never more than 6km away from the pyramid of the Louvre. Paris is bike friendly, mostly flat and has more than 700 km of cycle tracks. Although it offers an excellent public transport system, much is lost when visiting Paris by metro. In every building, at every corner you can discover something new. In addition to the beautiful monuments like Eiffel Tower, Notre Dame, Arc de Triomphe and the charm of the River Seine, Paris hides secrets in many picturesque alleys. The countryside also offers a fantastic infrastructure for cycling trips, which can be made 100% by bicycle or by combining bike & train. The landscapes of France are breathtaking! It wasn’t by chance that the impressionists, especially Monet, illustrated the exuberant nature of France in so many ways. 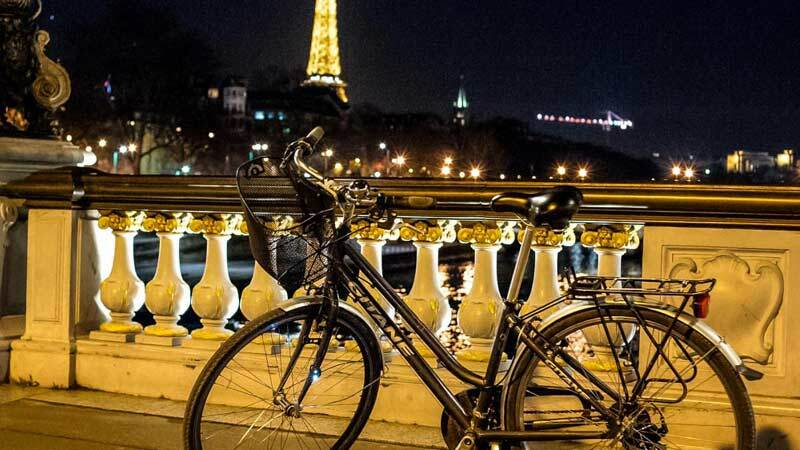 Join us and Go Bike Paris, let us take you and your friends on a ride through the French capital. Discover culture and history in a unique, fun, and social way. 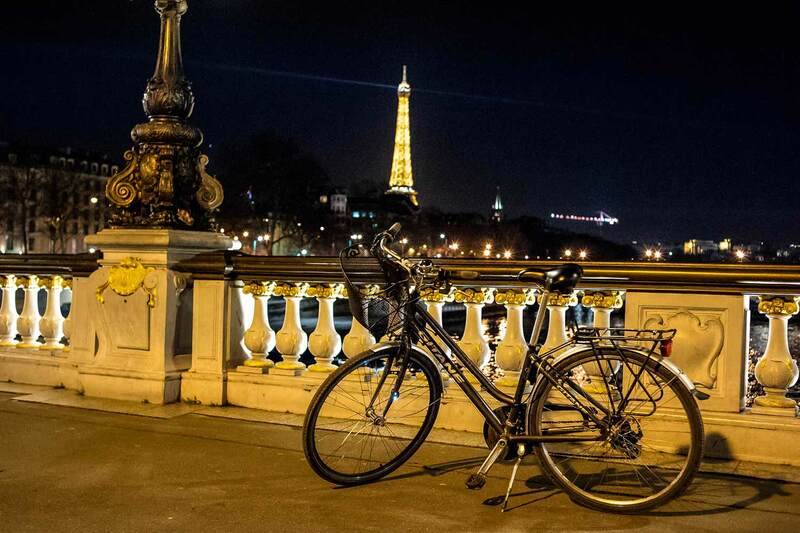 Cycling in Paris by night is an unforgettable experience: the city is bright and calm without the thousands of tourists who swarm around the monuments during the day. During the 3-hour tour you will cycle through the most significant places of the city, each stop is a place filled with history or an excellent spot for exclusive pictures in hidden places. 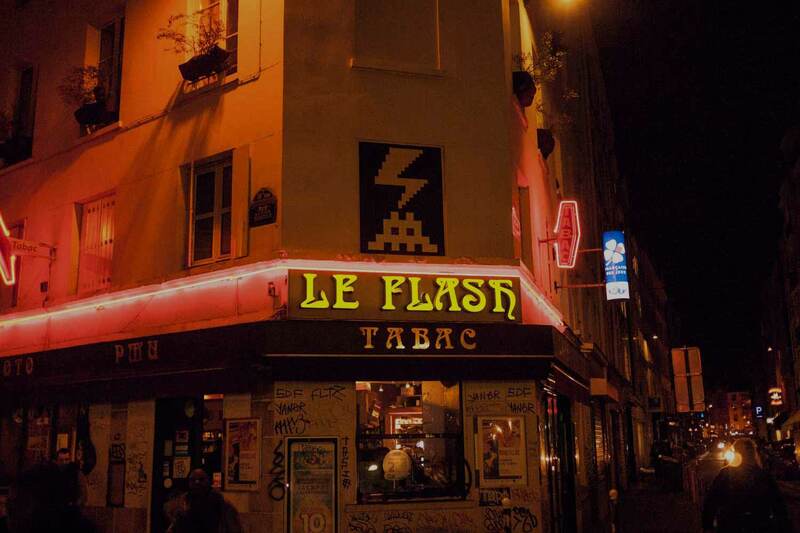 This tour is recommended for those who want to get to know the B side of Paris. The Paris of the Parisians, the less touristy side of the city. This region is now one of the most gentrified of the city. 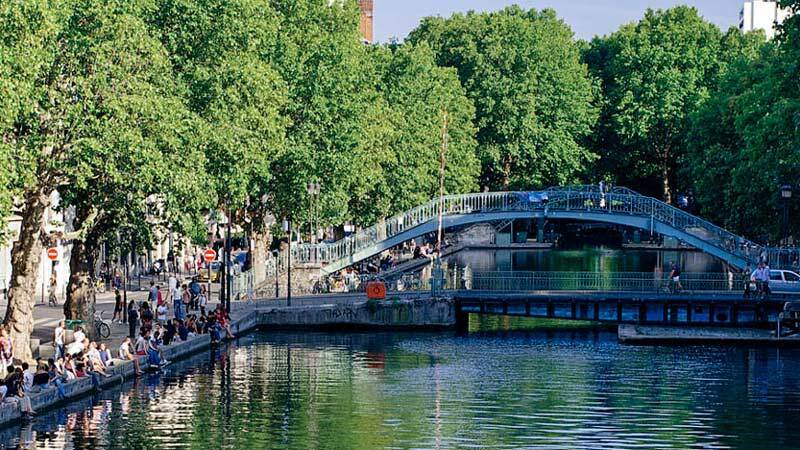 Before it was a quiet and old residential area, today it is a lively, young and modern district, surrounded by cafes, hip bistros and the famous iron bridge, immortalized in the movie Amelie Poulin. We love bikes. We believe that bikes are the vehicles of the future cities. 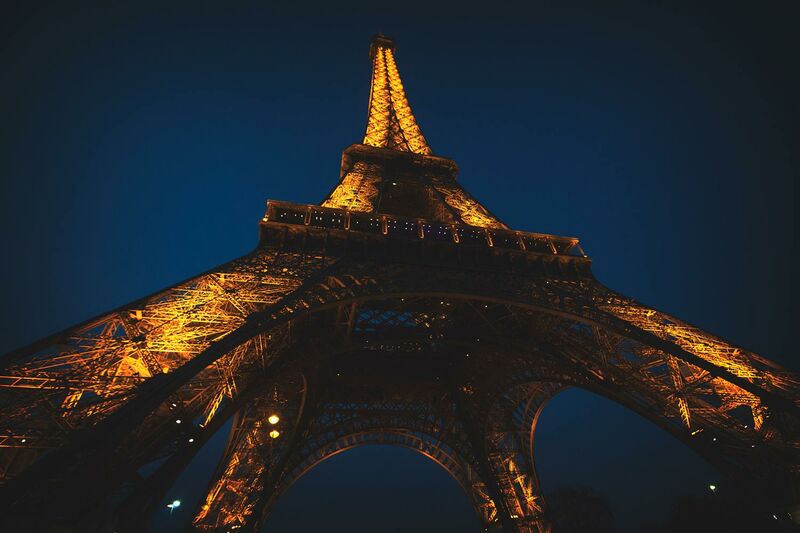 We are a team of people passionate for Paris, history and for travel. We just love our job! And we want to share it with you. 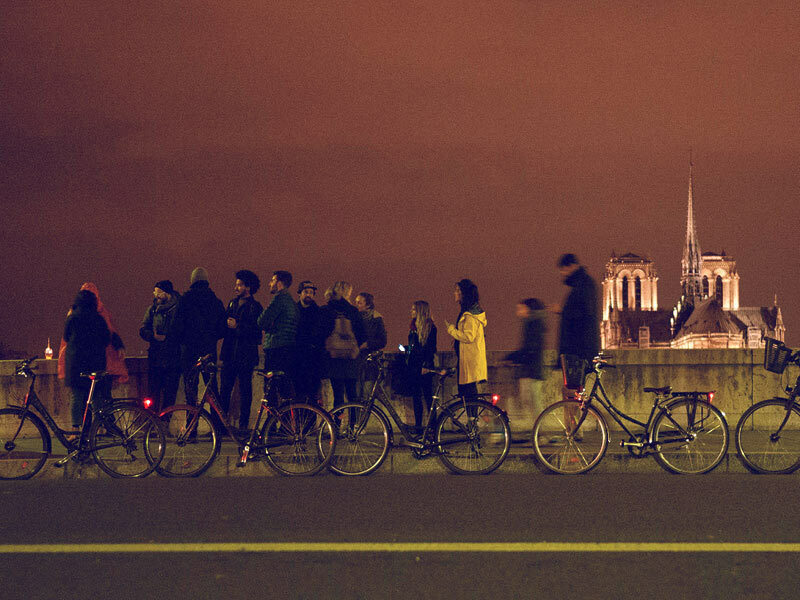 Our bike tours are made to take you off the beaten track, whether we show you the best street art or give you a glimpse of the night scenery. Cities are full of surprises and wonderfully quirky anecdotes. Our guides want to share more than a tour with you, they want to share their perspective and knowledge so that you can get a sense of the city and discover its local history, art and architecture with new eyes. The speed on the road will allow you to see more things, and actually slow down, taking the time to enjoy every step on the road. Chill, have a taste of local delights, smile at all the car drivers when you cheekily double-cross them. Biking truly awakens your adventurous spirit as you flow around the cityscape. Be audacious, throw your map, come with us, get out of your comfort zone and explore the secret nooks of the city. 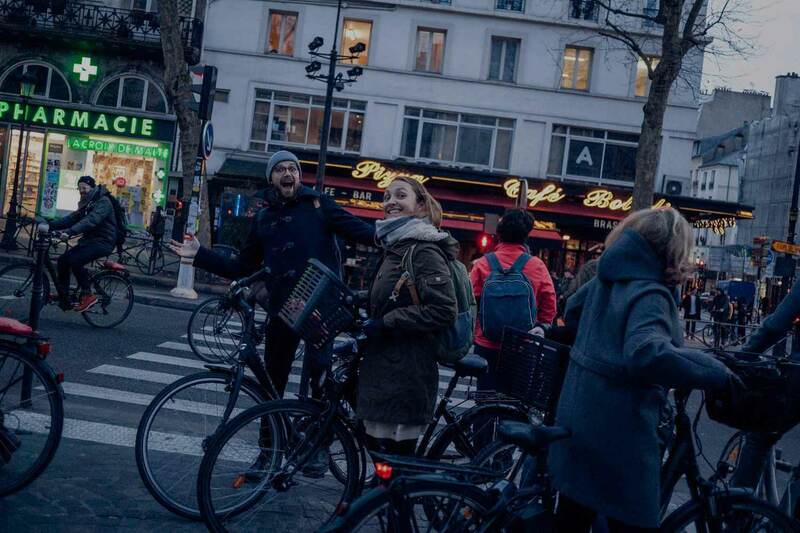 Bike tours are a sociable way to interact with the city, the locals and other travellers and to connect with awesome human beings from all over the world. Be active and use your legs! We think that an energetic lifestyle is the key for a happy body and a happy mind (scientists also agree with us). So biking is good for you, but it’s also good for planet. Riding bikes is a sustainable, harmless and noiseless way to move around cities. Protecting the environment and collaborating to make cities friendlier and healthier is the new cool! We believe that biking is the lifestyle of the future. It is a respectful, sustainable and sociable response to the need of our cities and we want to start this future with you. We believe that bikes are changing the world! The future of mobility and tourism is the bike. In addition, bikes offer great benefits for health, well-being and the environment. 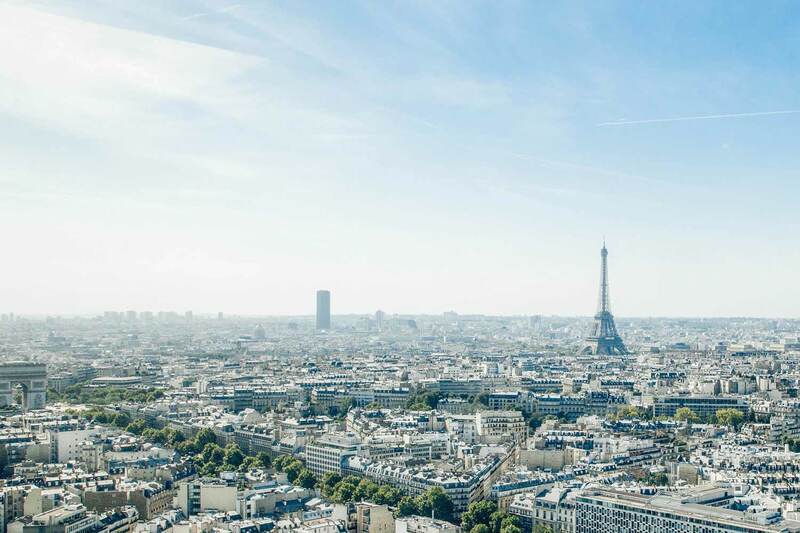 The purpose of Go Bike Paris is to be a B corporation – a sustainable and green company that thinks beyond just profits, but aims to develop the local economy including projects with communities. In addition, the bike experiences we offer to tourists allow people to have a more intimate contact with the cities. We believe that by providing pleasant experiences through cycle-tourism, we are encouraging people to introduce biking into their lives as their means of transportation. We believe that biking democratizes the use of public space and improves the quality of life. Besides, it’s a sustainable solution to the environmental, energy and urban mobility crises. Entrepreneur, passionate about bike & street-art culture. Her dream is to help to build more human cities. She already got more than 3.500 people to bike with her and her bike team since 2013. 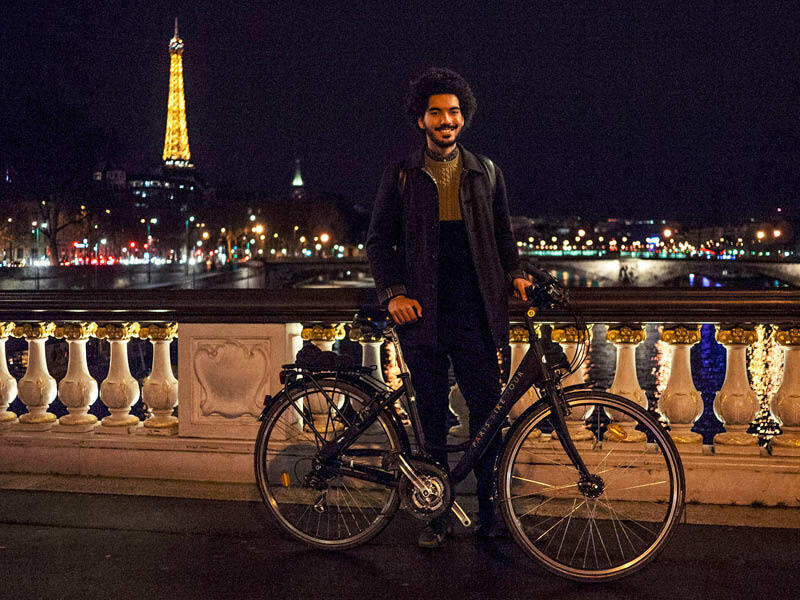 Art History graduate from École du Louvre in Paris, he is convinced that art brings us together and believes that visiting a city by bike is an original, sensible and eco-friendly way to enjoy local highlights. Master in physical education from Paris X University. She cycles every day and she is also a “bike angel”, teaching kids and adults how to ride bike for the first time in their life. Coming from different backgrounds they share the same ideas about what makes something good. Besides bikes they are passionate about art, music, board sports and travel. Get in touch with us! Questions, informations and feedback are always welcome.